Modelling boxes and plug-ins go a long way towards giving us the ability to DI guitar parts while still retaining the essential character of a miked amplifier, but unless you monitor very loudly while playing, the one element always missing is the way the vibrating strings of the instruments are excited by the sound from the speakers. Even at moderate volumes this adds sustain and a sense of energy to the sound of an amp, while at higher levels notes can be encouraged to feed back almost indefinitely. Which notes feed back and which don't depends in part on the distance between the guitar and the amplifier — and there are numerous stories of musicians marking spots on the floor using gaffa tape so they know where to stand to get specific notes to sustain. The feedback path between the guitar strings and the amplifier is complex, but I've always thought it should be possible to at least approximate it using modelling — and now Softube have developed a product that promises to do just that. 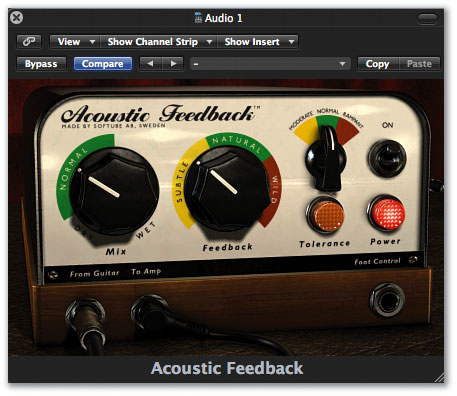 Acoustic Feedback is a native plug-in for both Mac OS (10.4 onwards) and Windows (XP or later) in VST, AU or RTAS formats; authorisation requires an iLok. Sample rates of between 44.1kHz and 192kHz are supported and the plug-in can work in whatever mono, stereo or hybrid mono/stereo modes are supported by the host. Softube confirm that their approach is based on modelling, but as the plug-in can't know the distance between the guitar and amplifier they've also included an 'auto positioner', which essentially makes every note behave as though the player is standing in just the right place to get it to feed back. As with a real guitar, lower-fretted notes feed back more readily than those above the 12th fret. Normally the Acoustic Feedback plug-in will be inserted in the guitar track before any amp modelling plug-in, and the guitar needs to be connected via a high-impedance input for best results (most interfaces now have an instrument input option, but if yours doesn't, an active DI box would do the job). There are very few controls, but adjusting them correctly is imperative for the best results. 'Mix' sets the balance between the actual guitar sound and the simulated feedback that is added to it and, as with the other controls, it can be automated (assuming the host application has automation facilities). 'Feedback' sets the rate at which the simulated feedback builds up, and also seems to affect the harmonic structure of the feedback: at low settings the effect is more subtle than at higher settings, where the timbre becomes more aggressive. A further control, 'Tolerance', sets how well the feedback effect tolerates string bending or vibrato. It is the counterpart to real-life amp volume and the relative position of the guitar and speaker. Low settings only allow feedback to build up on stable notes, while higher settings make the feedback effect 'take off' more readily, but can lead to less natural-sounding results at very high settings. Tolerance has three settings (Moderate, Normal and Rampant, which are easy to understand), while the other controls also have their 'normal' areas of operations highlighted. A virtual lamp shows how the feedback effect is developing. The feedback effect is really only designed to work when you play single notes. As you sustain a single note, the simulated feedback builds up and includes the usual harmonics and overtones heard in 'real' feedback. Unlike pedals such as the now discontinued Boss DF2 Feedback/Distortion, that fake the effect using a tracking oscillator that locks onto the last note played, this plug-in follows note bends and vibrato until the guitar string vibrations die away to the point where they can't be followed any longer, though if you stand close to your monitors and set them to a moderately loud level, you can get the feedback to go on as long as you like. At lower settings, it still seems to add an impression of life to chords, but without the sustaining feedback that you're able to get with single notes. The manual recommends that you deliberately terminate notes by damping, rather than allowing them to fizzle out, as some unnatural effects can otherwise occur, but other than that you just have to play and enjoy yourself. I found that setting the controls in their normal range or slightly lower sounded the most convincing, and while the effect isn't exactly like the real thing, it can sound very believable if used with care. The process doesn't respond well to excessive noise, so humbucking guitars will probably give better results for high-gain sounds, though I managed to get some nice results using a regular single-coil Strat. A MIDI expression pedal connected to the host software could be used to vary the feedback or mix controls during performance, or you could use automation during a mix to bring in the effect only where you need it. I also tested Acoustic Feedback on some sampled guitars and, providing the notes have a long sustain, it works fine — though if you don't have the means to damp the notes before they fade out, the sustain sound can sometimes end with a bit of a thump. Perhaps the designers can get around this in future versions by tracking the fading level of the original note and then crossfading to a buffer containing a loop of sound from a moment earlier, which could then be faded gracefully, rather than finishing with a bump.